The nation went to polls today to elect two parties which will contest the General Round of National Assembly (NA) Elections. A total of 182,216 voters out of 304,868 voted through the Electronic Voting Machine (EVM) across the country. Of the total 438,663 registered voters, 133,798 had registered to vote using the postal ballot facility. Despite, the unfavourable weather conditions, people came as early as early as eight in the morning in their respective polling stations to cast their votes. The polling booths opened from 9 am to 5 pm. 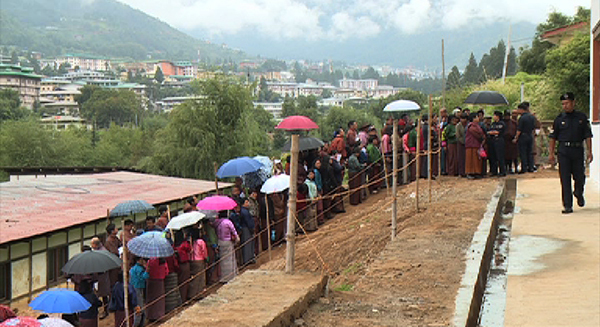 In Thimphu, the two constituencies have over 14,500 registered voters. “We were here in the line since the morning to vote. The elections come once in every five years, that is why I came to vote,” Tshering Wangyel, a voter in North Thimphu, said. Over in Trashigang, which has the highest number of registered voters, people came to the polls knowing only the best party should serve the country. “I feel the election is really important. It is an opportunity we get in five years to vote for the best party who serve the King and its people,” Dawa Tshering, a voter, said. In southern dzongkhag of Samtse, people old and young took it as their pride to come and vote. “Today, I came here to vote with all my family members. We are extremely happy to participate in this third parliamentary elections,” SP Pradhan, a voter, said. The poll day for the NA General Round Elections is on October 18.